Other than this purchase pictured bellow this was a hugely disappointing upload yet again. No running items that I’m in desperate need of. I would have seriously purchased an entire running outfit today if it had been uploaded. Pants, swiftlys and pullovers. So far I’ve ordered this SE Scuba Hoodie. 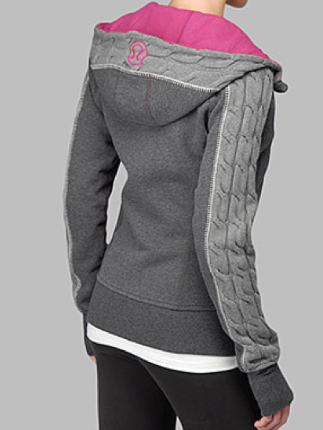 I love the white stitching in the hood and arms over the cable knit seam. My Cheer Gear Red Canada Hoodie has this and that’s my favourite part of it. I may not keep this though because I’m not sure how the cable knit will wash. Plus I feel like I need to protest the lack lustre “strategic” product releases. I think we’ve all been saving our pennies for some really great Fall items and running gear in the Lolo and Senorita Pink colors for a while now. And did it really need to take an hour and a half to upload all of those items? I just got a river rock gather racerback. I love the color, and returned my gray/river rock push ur limits yesterday because it was too similar to my other ones. Probably just getting the heathered lolo gather racerback. I got a citron one a couple weeks ago and just love the gathers on the back…so cute. Considering the Coal Embossed Bon Voyage Duffel, but just not sure I can justify it since I'd only use it a few times per year. I'm actually getting sick of saving my money for items that seem like they are never going to come! Why release coats, down vests, scarves, hats and gloves and not the running luon pullovers. I just don't understand it! I got the brisk run gloves, but that's it….was hoping for cute run pullovers, but nothin'! I considered the gloves but I have pretty small hands, so I just assumed the S/M would end up being too big. The scuba you got is very cute. But $$$. Sigh…. @lulumum….which store posted the new swiftly ss and inspires in lolo? i am in seattle and want to know if any of the stores out here have them. thanks! Lolo WWA and Audrey in Coal. Hope I love 'em! ugh.. wanted the Inspire this week.. I too was also hoping for some new running gear. Should I cave and buy the gloves.. or should I wait to see if any other colors will come out? I was looking for the senorita pink scuba today too.. also the LOLO purple CRB.. and no Audrey in Shark.. weird? Wanted the gloves but when I tried on in store my thumb was exposed! I ordered the Tadasana pants in lolo. I am very interested in these and they should go nice with my lolo scuba that came yeasterday, which I can't seem to take off! Does anyone know if the POM vest is tts? I'm usually a 6 in the remix, but an 8 in the define, if that helps? Thanks!! I'm trying to decide between that scuba and the lolo WWA. I also think I'm getting the gloves, the Tadasanas, and the LS Swiftly in Senorita pink. I just have to decide which hoodie…and what size in the gloves. Oh the decisions! The Brisk Run gloves were available all last winter, and there were pairs on the website through spring as well. I'm going to hold off purchasing them as I don't think they're different enough from last year's version, plus my thumb was exposed no matter what size I tried on. Last year there were warmer mitts, which I think is more what I need. It's annoying that the fall pullovers are not available yet. Quite useless to finally get the Revitalize Singlet now that it's too cold to wear it. Where are the fall run pants, etc? Lulumum and others…any tips on sizing on the scuba. I think I decided on that over the WWA. I haven't tried a scuba before but I have a remix in an 8 which I think is a little big, and a WWA in an 8 which is perfect. I'd usually just go for the 8 but I don't want it to be as big as my remix. Thanks! Tried on the Senorita Pink / Black Woven Scuba Hoodie and my daughter said it look like a rug on me. She like the Coal & Black one better. Lol to the rug comment. Thanks for the fit comments Lulumum. Let us know if you end up keeping yours! I picked of the Brisk Run Mitts last year ( the glove version but with a waterproof/windproof mitt cuff that folds over your fingers) and I was going tot sell them and pick up the new gloves this year because I love the watch slit but after all the annoying thumb reviews, I think I might just take mine to a tailor and get a watch slit made. Good idea Vicki! Those are the mitts I think I will want. It occurred to me too that my Garmin can go over just about any pullover I wear, and I can lock it if it's wet out. So, maybe the watch hole isn't a big deal for me after all. I do know the thumbhole problem would drive me crazy on the new gloves. The reality is I don't text, and I'd rather use my finger to adjust my iPod volume. no kidding on where's the running gear! it's still hotter than hot here, so i don't technically *need* cool weather stuff yet, but c'mon already, let's get some love for the runners! I am so relieved to find out I am not the only one to daydream about Lulu! This is how sad I am….There is a patio set I want half price for $198…my husband says go get it….I want it, but then I start thinking….I want the Audrey jacket more and it is almost the same price…boy, I sure know how to rationalize don't I??? OMG, I can't believe the Audrey jackets are already sold out on the Canadian side….I hope I can still get through the GEC! Hi it's me again ([email protected]:33). I should also point out that my apres yoga is about 2 years old, I don't know if the fit has changed? I take a 6 in the community and the track and field jacket….geez, maybe I have enough jackets? I'm pretty sure that scuba is going back tomorrow morning. I got the brisk run gloves last week in store and the neck warmer and ear warmer. I love the ear warmer as a headband and I actually used the neck warmer the other day to cover my hair in the rain and it looked pretty cute. well, I did sort of get my online ordering fix yesterday when I ordered my arbonne products which should arrive today. At least I get to play with new makeup and nice smelling skincare. yes it is pricey. I have to fall madly in love with it when I see it to be ok with the price. It was Lake Oswego. If you click on the pictures it links to the Facebook site. Oooh lucky hubby. I've been considering getting mine a Pacific Beach Hoodie as a prize for not nagging me about my lulu addiction. Your going to love the Audrey jacket. it's gorgeous on. you will! those are both great buys. I think the with the length of the Audrey you may be able to wear your WWA under it too. I would grab the gloves in case they sell out. It's a need for winter running. Just keep the tags on if your hoping to see it in another color. I was late to the game last year and couldn't get gloves or a scarf by the time I decided I needed it. But I also hadn't been online shopping back then either. I think TTS. I tried on the size 8 which I am on the high end of an 8 and it looked good and felt comfortable. I was also told that the side stretch panels will stretch out to your shape over time and have a bit more give after a few uses. The Remix is a boxier fit so I can see that one being big where as the scuba hugs you a bit more so the 8 shouldn't look baggy on you. Thanks Anon, my guess is we'll both get them at the same time. I assumed because of the interest in the pullover it would be uploaded before it hits stores, that way everyone has a fair opportunity. But I guess I was wrong. I think I'm going to have to keep stocking the stores so that I can report back to you guys right away. FYI I canceled my scuba order but I may repurchase it. I was just thinking if I had unlimited $$ I would get the scuba, the POM Vest and all of the running gear (swiftly in Lolo, lolo inspire crops all of the colors of the Inspire Pullover). Fireside pants. I'm daydreaming about this stuff, how sad. Hmm, If I had to guess I would say go with your Apres Yoga size. Hopefully we can get a few more responders to this that have also had or tried on the apres yoga jacket and can compare. I'm not surprised the jackets sold out. A lot have been commenting on the price but it's really not that unreasonable for milder temp locations. I'm having a hard time buying a scuba because that is a splurge for me. A good jacket or running gear are essentials. Re the gloves and the watch slit … I bought the gloves and fyi … only a smaller face watch will fit through the watch hole :(((( A Garmin … no way. Sad,lulu … these are supposed to be running gloves and yet a running watch won't fit ..